This is a very tiny 3/8" diameter dangle earring for women who love beautiful little earrings! The Irish Love Knot is one of the most classic and rercognizable designs of all time. In modern times, this image has been labled the Irish Love knot and is commonly refered to as the Love Knot. In ancient times, this design may have been more aligned with a protection symbol. 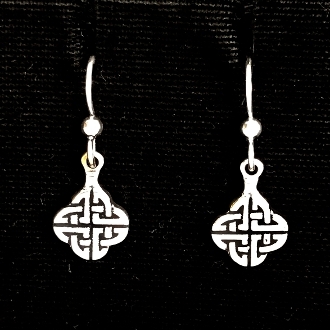 Beautiful, simple and traditional, this symbol has stood the test of time, and will carry on well into the future in expression of the intricacy and beauty of Celtic Art.